I've recently returned from a very enjoyable week away with the family in the Algarve, Portugal where I spent most of my time switching from sun lounger around the pool to sun lounger on the beach whilst supping the local ale (Super Bock) or quaffing a very moorish local 'Vino Verde'. This was purely a relaxing family holiday, but I did mange to pack bins and camera just in case I got the urge to put down the Factor 20 Suncream! When I did eventually leave the sun longer, I spent a morning at the Salgados Lagoons (Lagoa dos Salgados) just along the coast from Albufeira. This wetland reserve is under real threat from further tourist development in the area, with plans for more hotels and yet another golf course, but as it currently stands an objection and court proceedings are under way to try and stop these development proposals - I wish them well, as in the short time I had on the reserve it's a great location with some wonderful habitat and is very much worth saving. The reedbeds were full of Fantail Warblers and Sardinian Warblers called from every bit of sparse vegetation, Crested Larks and Hoopoes were flushed from the dusty dirt track and Bee-eaters flew over calling. 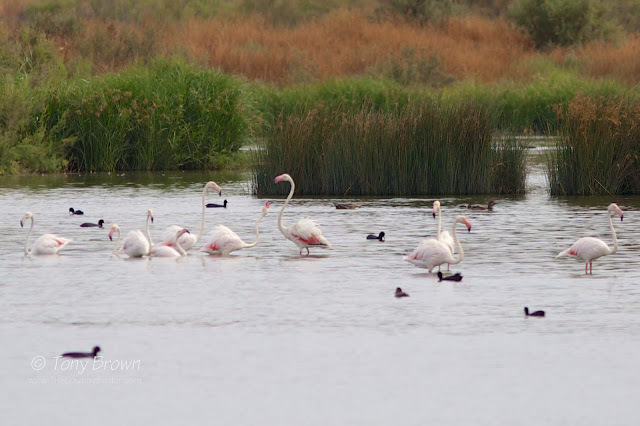 Following the wooden boardwalk around the lagoons the water was littered with Greater Flamingos, Great White, Little and Cattle Egrets, Glossy Ibis, Spoonbill and Grey and Purple Herons. A distant Marsh Harrier quartered the marsh and a Purple Swamphen squealed like a pig in the reeds. The water levels were a little high, but what exposed mud there was held several pairs of Black-winged Stilts, a Black-tailed Godwit and numerous Common Sandpipers. A Caspian Tern flew up and down the lagoon, Yellow Wagtails called overhead and Red-rumped Swallows were almost everywhere and to my surprise Kingfishers were abundant. I failed to find any Little Bitterns which spend their summers on the the reserve and the Woodchat Shrikes I had hoped for weren't playing ball in the Portuguese heat but I did manage a bonus pair of Azure-winged Magpies in the adjacent Golf Course as I was leaving. This was a cracking little reserve squeezed in between encroaching holiday resorts and well worth the visit if you are in the region, I just hope the developers don't eventually get there way! 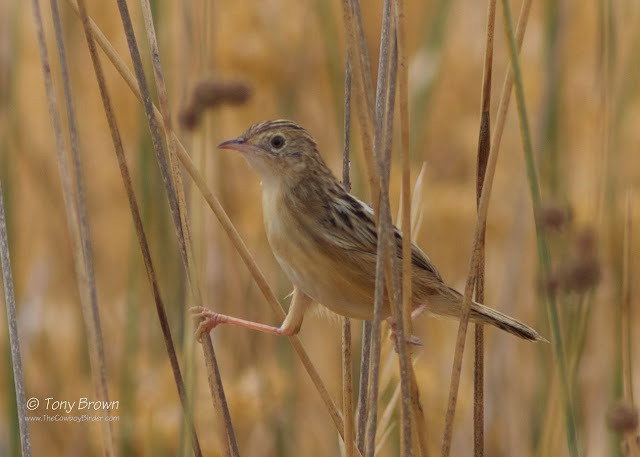 Why not help protect Salgados for the future and sign the petition below? After last weeks relative success and the first real autumn movement of passerines, with migrant Reed and Sedge Warbler, several fresh lemon yellow juvenile Willow Warblers and my first Northern Wheatear all seen on the Flats, I was hoping for more of the same today. There was another Wheatear, a couple of Willow Warblers, Yellow Wagtail and a new-in Common Sandpiper on Alexandra Lake but overall things felt generally quieter. 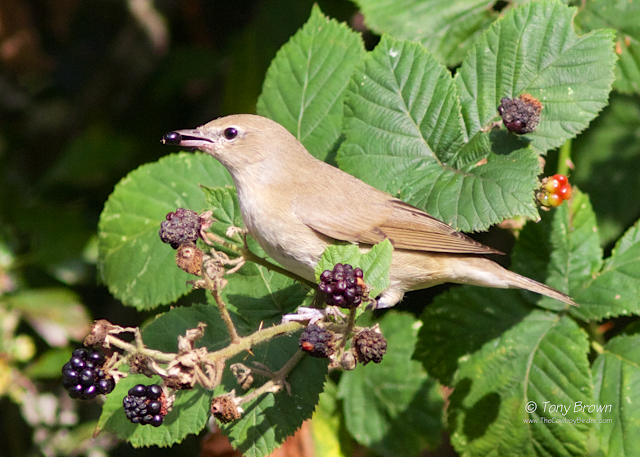 Just like last week, there were both Blackcap and Garden Warbler gorging on the ripened fruits on the bushes of the Elder and Blackberry, and there seems to be a healthy crop of Blackberries across Wanstead Flats which bodes well for the rest of the autumn for all of our Sylvia Warblers and for us patch birders!